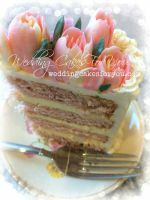 A Cherry Blossom Cake for a very special bridal shower. I was asked to be the Maid of Honor of a friend of mine. The funny part is, I am friends with the groom. His bride to be said that since we are so close she would love for me to be her Maid of Honor. She's a sweetheart, so I said yes. Well, they got engaged last month (July) and are getting married next month (August). That didn't leave me and his sister much time to plan the Bridal shower...and a gal needs a shower! Since the Bride is SO accommodating, we chose the theme of the shower. We were thrilled...she loves Japanese things, so we did an "Asian inspired tea party". Being in California, and the temperatures being so HOT, we decided to go with iced teas instead of hot tea. The cake of course was the next thing to design. Not a whole lot of people were coming, so something small and simple would suffice. Now, the couple dated before being engaged, then broke up for differences they thought were deal breakers. They dated other people, and even got engaged to other people...all the while apparently missing the other one. A little more than a year later, they literally "ran into each other" (she was running late from her lunch break and had her head buried in her work schedule...she works at a hospital, and he was running to get to the birth of his first niece). They saw each other, and couldn't forget about that meeting. A few weeks later, he showed up at her door and said "I'm never leaving you again". 10 months later, he proposed at the exact spot they met for the first time. So, I did an "Asian inspired" Cherry Blossom Cake. 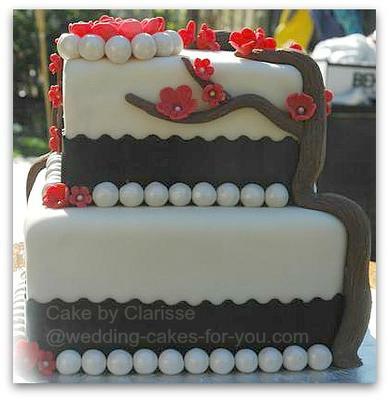 Her wedding colors are red, white, and black, so I incorporated that into the cake. I couldn't leave them out of the cake though...their story was too sweet and "Fairy tale like", so I made a locket with a picture of them in it, and on the other side, is the engraving "J+C 9/25/11" which is their wedding date. It's 100% edible, and is made out of an edible frosting sheet and gumpaste. The cake itself is an Orange Cream Cake, perfect for a hot summer day and an outside shower which I am including pictures of so you can get the entire feel for the day. Her future sister in law and I are also best friends and we just had the best time doing this shower for her. I wish them lots of love and lots of Blessings in the years to come! Hope y'all enjoy it. 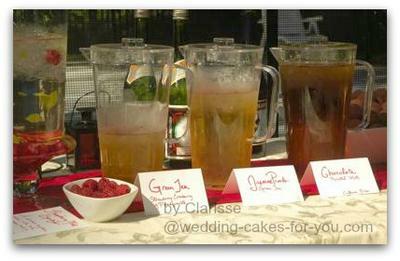 Thank you Clarisse for your Asian Inspired Bridal shower and cherry blossom cake. Great entry. Nice addition to show the table settings as well as the cake and for sharing a romantic story about the bride and groom. Good Luck. Yay! I love this cake...and the story is so cute! almost like a movie lol! Hope she loved it! great color combo! love it! great job! Love your idea of an Asian theme! 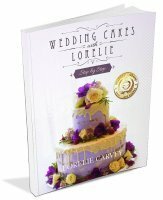 Darling cake, romantic story! I love the idea and how it turned out. You did an amazing job!! It is a fairy tail story for sure. The shower was fun and beautifully done and the cake was wonderful! Wow great cake! love the locket! Such a sweet idea! I love this cake as well as the story that was shared. Very sweet. The cake is beautiful and the creativity of adding the edible locket of the couple was a very unique idea! The bridal shower theme and the cake perfectly complimented each other. And Orange Dream cake was a fantastic choice for a hot summer day in California :) Nicely done Clarisse! Beautiful cake and how nice to tell their story with a cake..Awesome.. Oh my Goodness! What a perfect Cake. Almost too pretty to eat! 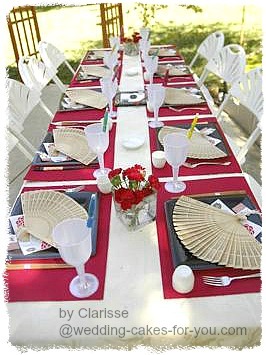 What a neat idea, to do an asian theme! I LOVE LOVE LOVE the square tiers! Love the little red details. Just enough color to be perfect! The cake is just as beautiful as the story behind it. The colors are awesome. The fact that you created such a beautiful cake incorporating the "love story" into it, in such a short amount of time, is a testament to your talent. Great job as usual! We love it! I love the locket and the color scheme. The story is so sweet too. Good luck! This is a very pretty cake! 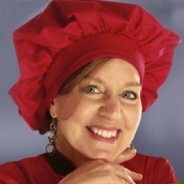 Good luck in the contest! Best it tasted great too! Great job as usual Risse. Hope she loved it! Can't wait to see the wedding cake!!!! Great job! Love the theme of the shower too! Great job! It sounds like it was a yummy cake too! The story was right from a dream all people have at one time or another. The cake was well done. Such an eye for detail what a precious cake for a precious couple. Great job! Cherry blossoms are timeless! Beautiful creation! Very pretty cake! <3 cherry blossoms! 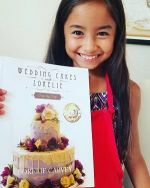 Very cute story to go along with a great cake! The story is movie worthy, and so is the cake. If there's a movie made about this couple then this cake needs to be duplicated for it! This is a really awesome cake! cherry blossoms are timeless and perfect for the occasion. beautiful creation! 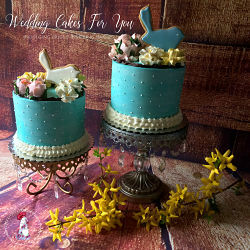 Love the romantic story as well as the pretty little details of the cake.Very well done. Can't beat a beautiful story to go along with a beautiful cake! Great job on this cake. It sounds like it was delish! 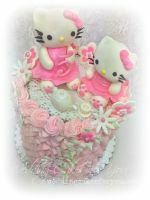 very pretty cake and a cute story to make it all that much more special! Now that's a story to go along with a beautiful cake! Great job! Love the sweet story behind it. The colors look great together. such an eye for the detail. So well decorated with a great eye for detail. Love the color combination especially since it is the colors of the wedding. Great job. I love the colors and all the decorations and the personal touches with the locket and their pictures. such a pretty cake.